The battle continues as the war between Sweden and Russia lasted for 9 years and this time Elk Studios takes you again in the familiar scenery with the Marching Reels Respin, Flames of War Free Spins and Sticky Wilds that create visually-appealing walls of flame. This is a 5-reel 4-row 40-payline video slot machine that can be played in both free play and real-money modes where the last-mentioned is able to produce a big win of 180.000 coins. Find all the particulars in the Poltava Flames of War slot review. Want to hop right into it? Try one of the recommended casino sites to play Poltava Flames of War with real money or spin some rounds in free play mode down below! To form a winning combination, you have to match 3 or more icons of the same kind placed on adjacent reels on the paytable. Troops have the highest rating and the winners will score 75-200 for 5 of them. Tips: for this purpose, you can also use the Poltava Wild. 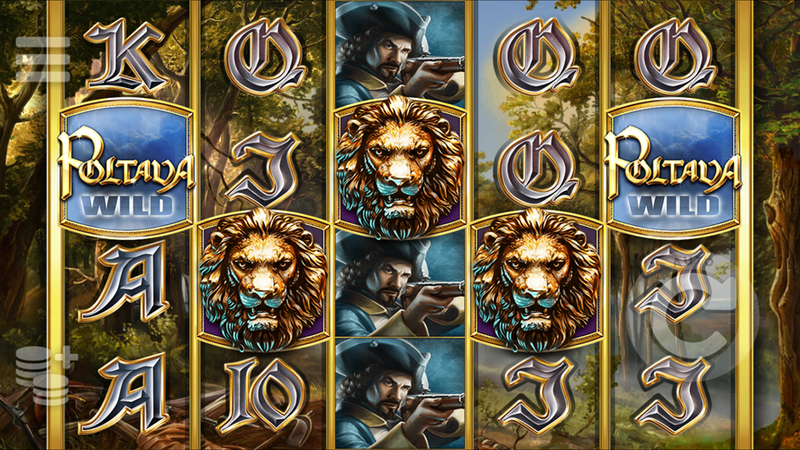 Whenever you land 3 or more Lions, you’ll trigger the Flames of War Free Spins round with 3 spins at the casino’s expense. Any Lion icon will turn into a Sticky Wild and remain its position until this round ends. When the entire reel is covered by 4 combat arm symbols, no matter if we speak about the Cavalry, Infantry or Artillery, the Marching Reels Respin feature will start and generate 1 extra spin during which the reinforcement will arrive on the reels 2 and 3. This will trigger the mini interactive sequence where all troops advance and generate winnings for as long as the matching combat symbols coming to the right. Being completely built in HTML5, the game will work fine on both mobile and desktop devices. Players are not required to download a special app to get it running. 3. What is the RTP factor of Poltava Flames of War? Officially, the RTP on the Elk Studios powered sites stands at 96.40%. As a sequel to the game set in the same scenery, the second iteration of Poltava was expected to redesign the mechanics or the paytable, but everything is pretty much the same as it was before. Still, don’t let this fact discourage you, since you have 180.000 reasons and favorable conditions to fight this battle again.